Alfalfa is a green superfood that is abundant in vitamins, minerals, and chlorophyll. It naturally has a balanced nutritional content and is an excellent source of Vitamin K. It has been consumed since ancient times and has been used by herbalists world-wide for centuries. Its name, “Alfalfa” comes from the Arabic language and means “Father of All Foods”. 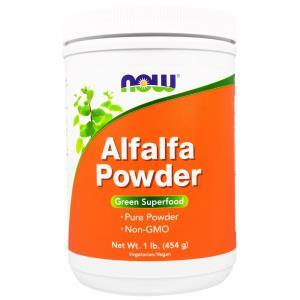 Alfalfa Powder can be blended into vegetable juices or used in baking or in vegetarian dishes.